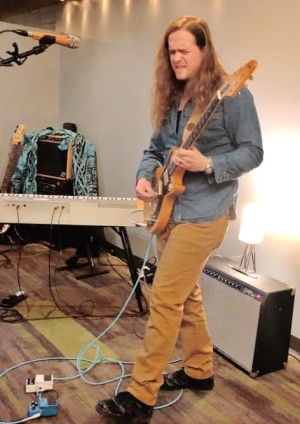 The solo venture of Cody James is the culmination of over 20 years of guitar playing in blues-based rock and punk bands. He loves the band setting but always had a vision for something greater. At age 7 he received his first guitar, and since playing his first live show at 14 he's been an active guitarist, singer, songwriter, and band leader. He's toured the country and self-released several albums with his current heavy rock band, Attalla, who are working on their third record and booking another national tour. James' determination and love for music has brought him to a new musical chapter in going solo, where he trudges forward, relentlessly chasing musical freedom. Eugeine Grey is a high energy American Alternative Acoustic Blues rock music enthusiast from Lombard, IL. Piecing together sounds from big names such as QOTSA, Nirvana, Highly Suspect, Local h and Aktar Aktar just to fill your head with sounds from the acoustic underground. Drawing from a wide array of influences, Ian Leith subscribes to the principle that a good song is a good song, no matter the genre. Listeners will detect hints of various styles in his diverse arsenal of original tunes and eclectic cover choices. A Scottish-Mexican Army brat born in West Texas, raised in Southern Illinois, seasoned in California, tested on the high seas as a cruise ship entertainer and currently calling Chicago home, Leith is adept at adaptation on his quest to discovering as much music that lies within as he can.